For new TSA officers, spotting a weapon or explosive hidden in a traveler’s baggage is a difficult challenge with potentially deadly consequences. That’s why it’s critically important for the Transportation Security Administration to know exactly what new trainees are looking at when they fail to pick up on suspicious items. A new training device called ScreenADAPT is making that a lot easier and is helping TSA officials improve training for for new TSA officers. The system tracks security officers’ eyes as they scan images, according to Eric Houser, director of the Mission Analysis Division within TSA’s Office of Requirements and Capabilities Analysis. 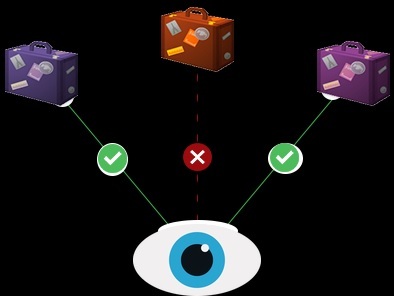 ScreenADAPT technology contains an eye scanner that reveals how trainees look at images of luggage. It measures how their eyes move and how long they look at a certain point on an image. TSA instructors are using the technology to supplement their training seminars; however, Houser said instructors are not going to start relying solely on the devices’ capabilities. Transportation security officers do not have to wear a special device as ScreenADAPT scans their eyeballs. The device consists of an eye-tracking device that attaches to a monitor and a software system that processes how a person is studying an image. The technology scans a person’s eyeball whether he or she is bespectacled or not. ScreenADAPT offers a more accurate picture of trainees’ pitfalls, according to Houser. Pass/fail assessments only show which questions a trainee answered correctly. ScreenADAPT, on the other hand, allows instructors to analyze a person’s search patterns, offering clues as to where he or she may be missing some points. TSOs are not required to study a certain number of images during their training. Don Morrison, a program analyst in TSA’s Mission Analysis Division, said that instructors usually look at the amount of time a trainee has spent studying images, rather than the raw number of images he or she has scanned. ScreenADAPT allows trainees to move at their own pace and focus on certain areas in which they have trouble, he said. According to Morrison, who served as a security manager in the field prior to becoming a program analyst, ScreenADAPT will benefit TSOs because it offers a more detailed kind of feedback. According to Houser, it is too early in the program to have definite numbers on the technology’s effectiveness, but he said that directors at airports where ScreenADAPT is in use have “seen enhancements” after just a few months. TSA started developing ScreenADAPT in tandem with DHS S&T three years ago. Over the past few months, 50 ScreenADAPT systems have been deployed across six airports, namely LaGuardia, Pittsburgh, Portland, Houston, Las Vegas, and Raleigh-Durham. Houser said TSA plans to test ScreenADAPT at a couple of more airports before the pilot program ends in September.